Jayber Crow, the barber of Port William, Kentucky, tells the story of his life. Orphaned twice as a child, Jayber spent most of his childhood in a strict Christian orphanage called The Good Shepherd outside of his birth town. Jayber started seminary because he thought he was called to be a minister, but he soon realized that he didn’t entirely believe what the elders taught him about the Bible. After quitting seminary, Jayber returned to Port William and was given a barbershop to live in and run. 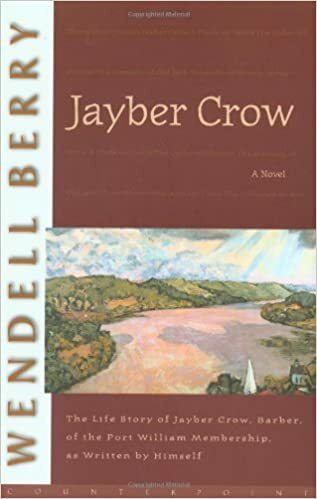 Jayber Crow by Wendell Berry is the story of a melancholy barber living in small-town America during most of the 20th century. This is a novel about an obscure man living in an obscure town. I lived in Kentucky for six years. I grew up in a suburban family in the North. In Kentucky, people don’t say that they come from X city. They say instead that they come from X county. When you live in Kentucky, you encounter a demographic in America that is often overlooked by the Media. Besides horses and bourbon, the state is known for its coal mining, corrupt politicians, and poverty. Kentucky was quite different from where I grew up. Now that I don’t live in Kentucky anymore, I am constantly on the lookout for books that remind me of that state. Wendell Berry is to Kentucky what Harper Lee is to Alabama. His works celebrate the culture of Kentucky and describe the occupations of its citizens. They speak to the joys and concerns of some of the least acknowledged people in our nation. As a result, Kentuckians love Wendell Berry. Kentucky bookstores proudly display his books, and some have shelves dedicated entirely to Wendell Berry. He is a novelist, an essayist, a short story writer, a poet, and an environmentalist. Despite having written over 40 books, Berry is little known outside of his home state. The typical Barnes & Noble might carry one or two books by Berry. While reading Jayber Crow, I felt like I was back in Kentucky. The title character and narrator is a child during WWI, a young man during WWII, and an ageing man during the Korean and Vietnam wars. The fictional town of Port William witnesses the rise of global capitalism and the replacement of small farms by large agro-businesses. Jayber Crow learns much about life from the people he meets and the jobs he performs. He desires what he can’t have, but he is often surprised by unexpected blessings. While Wendell Berry’s novel can sometimes be too sentimental with its lyrical, philosophy-rich prose, I felt profoundly for the narrator. I was frequently moved by his reflections. If you enjoy the writings of Willa Cather and (especially) Marilynne Robinson, I highly recommend Jayber Crow. Wendell Berry is an author who deserves wider recognition. with the labor of words. hungers for the sweet of speech. that is not a name. that my hope is, and my aim. Update: I have not blogged in almost 2 months. I switched graduate programs from entomology to French and have been really busy reading for school. I know that I was supposed to participate in read-alongs that I had organized, but I bit off way more than I could chew. I hope to get to the books at some point before the end of the year, but it may not be for a while. I apologize for dropping the ball. Until I have more time do read for pleasure, I will post more poems or reviews of plays than book reviews. I may even discuss some philosophical treatises I’ve read. But I will be moving at a slower pace than I have in the past.